Despite a concerted effort to increase student attendance, the number of LA Unified students who missed 16 or more days of school in 2015-16 grew by 1 percent from the previous year, this month’s budget documents show. The increase in the number of students who were chronically absent cost the district $45 million in state revenue that year, officials said. But a bright spot was attendance by foster youth. Their chronic absence rate dropped, and for long-term foster youth, it fell sharply, by 30 percent — the result of targeting specific supports to these students, district staff said. The district’s overall chronic absence rate last year was 14 percent, an increase from 13 percent the year before, according to the district’s Local Control and Accountability Plan (LCAP), a document that outlines the district’s progress on goals under the state’s Local Control Funding Formula. LA Unified’s rate is now twice the state average. The focus on increasing attendance is driven in large part by finances. State funding is based on student attendance. A 14 percent chronic absence rate means the district lost out on about $630 million in state funding last year. The district’s chronic absence rate for 2016-17 will not be calculated until later this summer, officials said. A report issued by the Independent Financial Review Panel in November 2015 recommended that the district work to improve its chronic absence rate not only to improve academic outcomes for students, but because the district’s average daily attendance rate is the biggest factor in district revenues. The panel pointed out that the district’s chronic absence rate exceeded the state average. Former California Attorney General Kamala Harris, in addressing chronic absence and truancy in California schools, issued a report that showed the state’s chronic absence rate in 2015-16 was 7 percent. One of Superintendent Michelle King’s goals is 100 percent attendance as a way of achieving 100 percent graduation, as outlined in her strategic plan. The chronic absence rate goal for 2016-17 is 11 percent, then decreasing by 2 percentage points each year through 2018-19. Chronic absenteeism is also now used to measure accountability for districts and schools. It is part of the California Dashboard, the state’s new accountability system for schools, and is slated to be included in the state’s accountability system under the Every Student Succeeds Act, which is being developed by state officials. 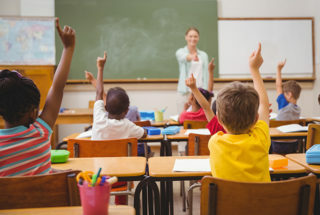 In its draft ESSA plan, the state notes that the chronic absence rate will be used as an academic indicator for students in kindergarten through eighth grade because of its “strong correlation to future academic attainment.” Studies have shown the connection between being repeatedly absent from school to failing or dropping out of high school. A memo to the school board from King shows ways the district is trying to improve attendance in response to the recommendations from the Independent Financial Review Panel. It shows that the district is still in the process of implementing some of the recommendations including analyzing attendance data on a monthly basis and reallocating funds to schools that are not meeting LCAP targets for student attendance. It has implemented monthly attendance progress presentations from the division of Student Health and Human Services to local districts leadership teams, who then review the data with school principals. The LCAP does note that while the overall chronic absence rate has increased across the district, the rate for foster youth has decreased by 4 percent and for long-term foster youth it has declined from 23 percent to 15.8 percent. Erika Torres, the district’s executive director of Student Health and Human Services, said nurses and counselors try to address students’ social and emotional needs that might be a barrier to coming to school. She said one of the reasons why students are chronically absent is trauma, especially among the district’s 7,400 youth in the foster care system. The district has 80 foster youth counselors, who connect students with resources like tutoring and mentoring as well as developing an educational plan. “We’re seeing major improvements with the targeted supports we’re providing,” Torres said. Other reasons students might be chronically absent include having concerns about safety either in their community or at school or if a student’s basic needs aren’t being met, like shelter, food, and clothing. Another area of attendance focus is capturing the roughly 1,500 students who are incarcerated once they are released from custody to ensure that they return to school. The grades where regular attendance is the biggest problem are transitional kindergarten and ninth grade. Counselors talk to parents of the transitional kindergarten students who might not think attending school every day is important about research that shows regular attendance in the younger grades increases the likelihood that students will read at grade level and graduate high school on time. For the ninth-graders who miss school, counselors focus on connecting them with a caring adult who can talk about the transition from middle to high school and the A-G course requirements, a set of classes required for entrance to the state’s public universities.